The European research project CASCADES’ objective was “to define the cascading use of wood and assess the environmental and socio-economic impacts of cascading, to identify and analyse the barriers preventing cascading”. As a central element of the project a wood flow analysis was conducted. From page 26 the 2016 final report [Vis M., U. Mantau, B. Allen (Eds.) (2016) Study on the optimised cascading use of wood. No 394/PP/ENT/RCH/14/7689. Final report. Brussels 2016. 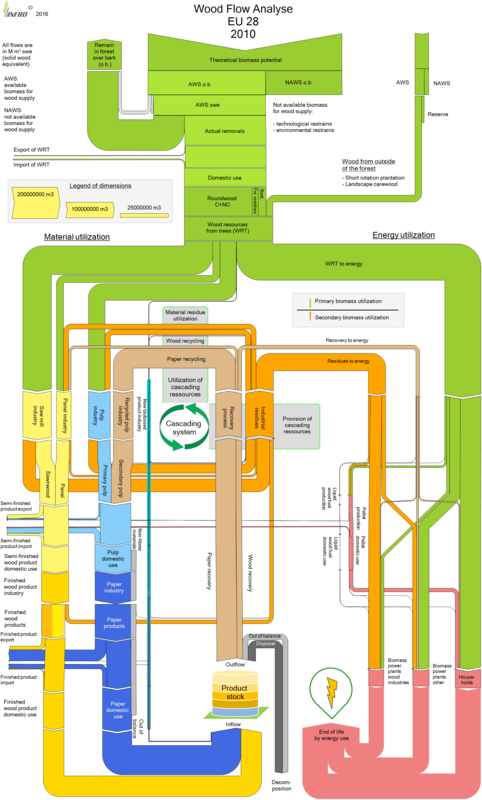 337 pages)] comes this Sankey diagram depicting wood flows in the European Union (EU-28). All flows are in Mm³ swe (solid wood equivalent). No absolute numbers are given to quantify the flows, instead three sample arrows serve a reference to the scale (“Legend of dimensions”). The wood biomass is either used as material (left branches) or as energy (right branch). On the material side wood industry (yellow path) and paper industry (blue path) take up most of the biomass. Residues of both industries along with a good chunk of the post-consumer paper waste are being recovered and led in a cascading loop, until they eventually shift to the energetic side. A complex and interesting Sankey diagram with much to discover. The CASCADES report describes all the areas of the wood flow system, identifies hotspots and describes measures for optimization.